If the IRS has satisfied the pre-levy requirements according to federal statutes for a tax liability assessed against you, the IRS can levy any property belonging to you, including bank accounts. In United States v. Nat’l Bank of Commerce, 472 U.S. 713, 719-20, 105 S. Ct. 2919, 2924-2925 (1985), the Supreme Court held that the statutory language “all property and rights to property” appearing in Section 6331 “is broad and reveals on its face that Congress meant to reach every interest in property that a taxpayer might have.” Indeed, the Court has long held the view that “[s]tronger language could hardly have been selected to reveal a purpose to assure the collection of taxes.” Glass City Bank v. United States, 326 U.S. 265, 267, 66 S. Ct. 108, 110 (1945). Any person who fails or refuses to surrender any property or rights to property, subject to levy, upon demand by the Secretary, shall be liable in his own person and estate to the United States in a sum equal to the value of the property or rights not so surrendered, but not exceeding the amount of taxes for the collection of which such levy has been made, together with costs and interest on such sum at the underpayment rate established under section 6621 from the date of such levy… . Subsection (c) of 26 U.S.C. § 6332 provides a special rule with respect to banks. “Any bank… shall surrender (subject to an attachment or execution under judicial process) any deposits (including interest thereon) in such bank only after 21 days after service of levy.” As explained by the House Conference Report for the 1988 act which added this subsection, this special rule “[p]ermits the Secretary to demand surrender of bank accounts only after 21 days in escrow have passed since service of the notice of levy on the accounts.” H. Rept. 100-1104, October 21, 1988, Bill Summary & Status, 100th Congress (1987-1988), H.R. 4333. Thus, while service of the notice of IRS levy under the general rule creates a “custodial relationship” between the person holding the property and the United States until the property is turned over to the government (Nat’l Bank, 417 U.S. at 720), the special rule with respect to banks under Section 6332(c) extends that custodial escrow period to a minimum of 21 days. The Treasury Regulations also emphasize the custodial escrow relationship during this period, explaining that “[n]o withdrawals may be made on levied upon deposits during the 21-day holding period, or any extension thereof.” 26 C.F.R. 301.6332-3(c)(3). 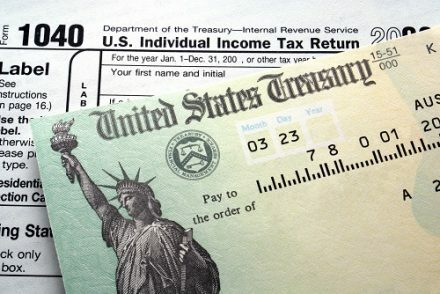 This 21 day period allows the IRS and the taxpayer or another individual named on the account to resolve issues regarding ownership of the account while the money is held by the bank, a practical measure the IRS was already seeking to address by asking the banks to place such a hold on accounts with two names by the time Section 6332(c) was enacted in 1988. See IR 87-87 (IRS News Release), 1987 WL 448126. The language “any deposits (including interest thereon)” in Section 6332(c) requires the bank to “include any interest that has accrued on the deposits prior to and during the holding period, and any extension thereof, under the terms of the bank’s agreement with its depositor” when it surrenders the levied deposits. 26 C.F.R. 301-6332-3(c)(2).